Modern founder of the social contract tradition; life in the state of nature is "solitary, poor, nasty, brutish and short"
Thomas Hobbes of Malmesbury (/hɒbz/; 5 April 1588 – 4 December 1679)ఆంగ్ల రాజనీతి తత్వవేత్తలలో ధామస్ హాబ్స్ అగ్రగణ్యుడు. హాబ్స్ 1651లో రచించిన లెవియథాన్, పాశ్చాత్య రాజనీతి తత్వశాస్త్రానికి పునాది వంటిది. క్రమబద్ద తాత్విక రాజనీతి భావాలను ప్రతిపాదించిన మొదటి ఆంగ్ల రాజనీతివేత్త. హాబ్స్ 1588లో వెస్ట్ పోర్ట్ లోని ఒక సాధారణ మతాధికారికి రెండవ కొడుకుగా జన్మించాడు. హాబ్స్ చిన్నతనంలోనే అతని తండ్రి భార్యను పిల్లలను వదిలివేసాడు. 15వ యేట ఆక్స్ ఫర్డ్ లోని మెగాలెన్ కళాశాలలో ప్రవేశించి 1608లో పట్టభద్రుడైనాడు. ఐతే విశ్వవిద్యాలయంలో నేర్చుకున్న విద్య హాబ్స్ కు ఏమాత్రం సంతృప్తినివ్వలేదు. కాగా నిరుపయోగమైనదిగా, నిస్సారమైనదిగా భావించాడు. హాబ్స్ తన సమయాన్ని ఎక్కువగా గ్రంధాలయాల్లో, పుస్తకాల దుకాణాలలో గడిపేవాడు. MacDonald, Hugh & Hargreaves, Mary. Thomas Hobbes, a Bibliography, London: The Bibliographical Society, 1952. Hinnant, Charles H. (1980). Thomas Hobbes: A Reference Guide, Boston: G. K. Hall & Co.
Sacksteder, William (1982). Hobbes Studies (1879–1979): A Bibliography, Bowling Green: Philosophy Documentation Center. Garcia, Alfred (1986). 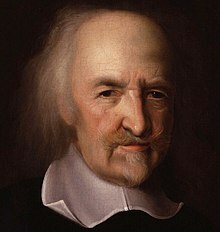 Thomas Hobbes: bibliographie internationale de 1620 à 1986 Caen: Centre de Philosophie politique et juridique Université de Caen. Thomae Hobbes Malmesburiensis Opera Philosophica quae Latina Scripsit, Studio et labore Gulielmi Molesworth, (Londini, 1839–1845). 5 volumes. Reprint: Aalen, 1966 (= OL). The English Works of Thomas Hobbes of Malmesbury; Now First Collected and Edited by Sir William Molesworth, Bart., (London: Bohn, 1839–45). 11 volumes. Reprint London, 1939-–; reprint: Aalen, 1966 (= EW). The Elements of Law, Natural and Politics, edited with a preface and critical notes by Ferdinand Tönnies, London, 1889 (first complete edition). Tractatus opticus II, (1639, British Library, Harley MS 6796, ff. 193–266) first partial edition in "The Elements of Law Natural and Politics", Appendix II, pp. 211–226; first complete edition (but with the omission of the diagrams) by Franco Alessio, Rivista critica di storia dela filosofia, 18, 1963, pp. 147–228. De Motibus Solis, Aetheris & Telluris (pp. 439–447: a Latin poem on the movement of the Earth). Notes in English on an ancient redaction of some chapters of De Corpore (July 1643; pp. 448–460: MS 5297, National Library of Wales). Notes for the Logica and Philosophia prima of the De Corpore (pp. 461–513: Chatsworth MS A10 and the notes of Charles Cavendish on a draft of the De Corpore: British Library, Harley MS 6083). Of the Life and History of Thucydides, in Hobbes's Thucydides, edited by Richard Schlatter, New Brunswick, pp. 10–27, 1975. Three Discourses: a Critical Modern Edition of Newly Identified Work of the Young Hobbes (TD), edited by Noel B. Reynolds and Arlene Saxonhouse, Chicago, 1975. A Discourse upon the Beginning of Tacitus, in TD, pp. 31–67. A Discourse of Rome, in TD, pp. 71–102. A Discourse of Law, in TD, pp. 105–119. Thomas Hobbes' A minute or First Draught of the Optiques, (British Library, Harley MS 3360) Critical Edition by Elaine C. Stroud, Ph.D. dissertation, The University of Wisconsin-Madison, 1983. Of Passions, Edition of the unpublished manuscript Harley 6093 by Anna Minerbi Belgrado, in: Rivista di storia della filosofia, 43, 1988, pp. 729–738. The Correspondence of Thomas Hobbes, edited by Noel Malcolm, Oxford: the Clarendon Edition, vol. 6–7, 1994 (I: 1622–1659; II: 1660–1679). De Corpore, Part I. Computatio Sive Logica. Edited with an Introductory Essay by L C. Hungerland and G. R. Vick. Translation and Commentary by A. Martinich. New York Abaris Books, 1981. Thomas White's De mundo Examined, translation by H. W. Jones, Bradford: Bradford University Press, 1976 (the appendixes of the Latin edition (1973) are not enclosed). Clarendon Edition of the Works of Thomas Hobbes, Oxford: Clarendon Press (10 volumes published of 27 planned). Traduction des Œuvres Latines de Hobbes, under the direction of Yves Charles Zarka, Paris: Vrin (5 volumes published of 17 planned). Brandt, Frithiof (1928). Thomas Hobbes' Mechanical Conception of Nature, Copenhagen: Levin & Munksgaard. Jesseph, Douglas M.(1999), Squaring the Circle. The War Between Hobbes and Wallis, Chicago: University of Chicago Press. Leijenhorst, Cees (2002). The Mechanisation of Aristotelianism. The Late Aristotelian Setting of Thomas Hobbes' Natural Philosophy, Leiden: Brill. Lemetti, Juhana (2011). Historical Dictionary of Hobbes's Philosophy, Lanham: Scarecrow Press. Macpherson, C. B. (1962). The Political Theory of Possessive Individualism: Hobbes to Locke, Oxford: Oxford University Press. Malcolm, Noel. (2002). Aspects of Hobbes, New York: Oxford University Press. Malcolm, Noel. (2007). Reason of State, Propaganda, and the Thirty Years' War: An Unknown Translation by Thomas Hobbes, New York: Oxford University Press. Manent, Pierre. (1996) An Intellectual History of Liberalism, Princeton: Princeton University Press. Martinich, A. P. (2003) "Thomas Hobbes," The Dictionary of Literary Biography, Volume 281: British Rhetoricians and Logicians, 1500–1660, Second Series, Detroit: Gale, pp. 130-144. Martinich, A. P. (1995) A Hobbes Dictionary, Cambridge: Blackwell. Martinich, A. P. (1997) Thomas Hobbes, New York: St. Martin's Press. Martinich, A. P. (1992) The Two Gods of Leviathan: Thomas Hobbes on Religion and Politics, Cambridge: Cambridge University Press. Martinich, A. P. (1999) Hobbes: A Biography, Cambridge: Cambridge University Press. Narveson, Jan; Trenchard, David (2008). "Hobbes, Thomas (1588 –1679)". In Hamowy, Ronald. The Encyclopedia of Libertarianism. Thousand Oaks, CA: SAGE; Cato Institute. pp. 226–7. ISBN 978-1-4129-6580-4. LCCN 2008009151. OCLC 750831024. Oakeshott, Michael (1975), "Hobbes on Civil Association", Oxford: Basil Blackwell. Pettit, Philip (2008). Made with Words. Hobbes on Language, Mind, and Politics, Princeton: Princeton University Press. Robinson, Dave & Groves, Judy (2003). Introducing Political Philosophy, Icon Books. ISBN 1-84046-450-X. Ross, George MacDonald (2009). Starting with Hobbes, London: Continuum. Shapin, Steven and Shaffer, Simon (1995), Leviathan and the Air-Pump. Princeton: Princeton University Press. Skinner, Quentin. (1996). Reason and Rhetoric in the Philosophy of Hobbes, Cambridge: Cambridge University Press. Stomp, Gabriella (ed.) (2008). Thomas Hobbes, Aldershot: Ashgate. Strauss, Leo (1936). The Political Philosophy of Hobbes; Its Basis and Its Genesis, Oxford: Clarendon Press. Strauss, Leo (1959). "On the Basis of Hobbes's Political Philosophy," in What Is Political Philosophy?, Glencoe, IL: Free Press, chap. 7. Tuck, Richard (1993) Philosophy and Government, 1572–1651, Cambridge: Cambridge University Press. Vieira, Monica Brito. (2009) The Elements of Representation in Hobbes, Leiden: Brill Publishers. Zagorin, Perez. (2009) Hobbes and the Law of Nature, Princeton NJ: Princeton University Press. ↑ Timothy Raylor, "Hobbes, Payne, and A Short Tract on First Principles," The Historical Journal, 44, 2001, pp. 29-58. "Hinduism" to "Home, Earls of", available at Project Gutenberg. Wikimedia Commons has media related to థామస్ హాబ్స్. థామస్ హాబ్స్ గురించి/చే రచింపబడిన మూల కృతులున్నాయి. Script error: No such module "Internet Archive". Thomas Hobbes nominated by Steven Pinker for the BBC Radio 4 programme Great Lives. ఈ పేజీలో చివరి మార్పు 2 అక్టోబరు 2017న 13:54కు జరిగింది.